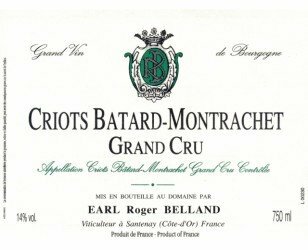 The Criots Bâtard Montrachet is one of the 7 Grands Crus Blancs of Burgundy and is one of the 5 grands crus of the Montrachet family. Located south of the Côte de Beaune in Chassagne-Montrachet, the appellation represents only 1.50 hectares, the smallest of the 5 Grands Crus of Montrachet. Domaine Roger Belland owns almost a third of the appellation. The estate vinifies its wines with a lot of sweetness and delicacy. 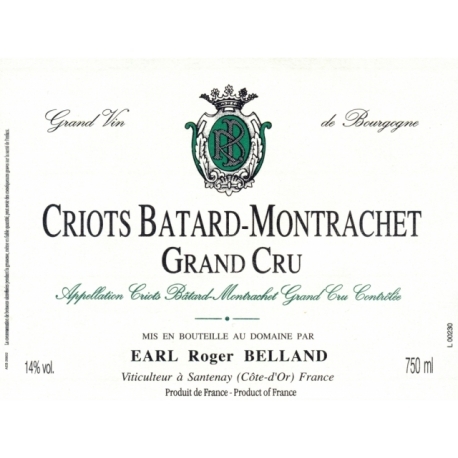 The Batard Montrachet Grand Cru Criots are aged for example 8 months in French oak barrels, 90% new. Only the finest wines can cause this type of intense emotions when they open. here, the pleasure begins with the visual: the dress will be gold with emerald reflections, the bouquet will offer an extremely complex bouquet that will go from hot pastries, dried fruits, spices to honey. Very harmonious wine with perfect balance, which will offer incredible power, structure, roundness and persistence. Julie Belland represents the new generation of the estate. She brought new ideas and gives a great energy to the production and marketing of wine. Accompanied by the experience of his father, the Belland are at the head of a magnificent estate located in Santenay and Wine Maker of beautiful domain of vines in villages, Premiers Crus and even Grand Cru appellations, with a good part of Batard Montrachet Criots .